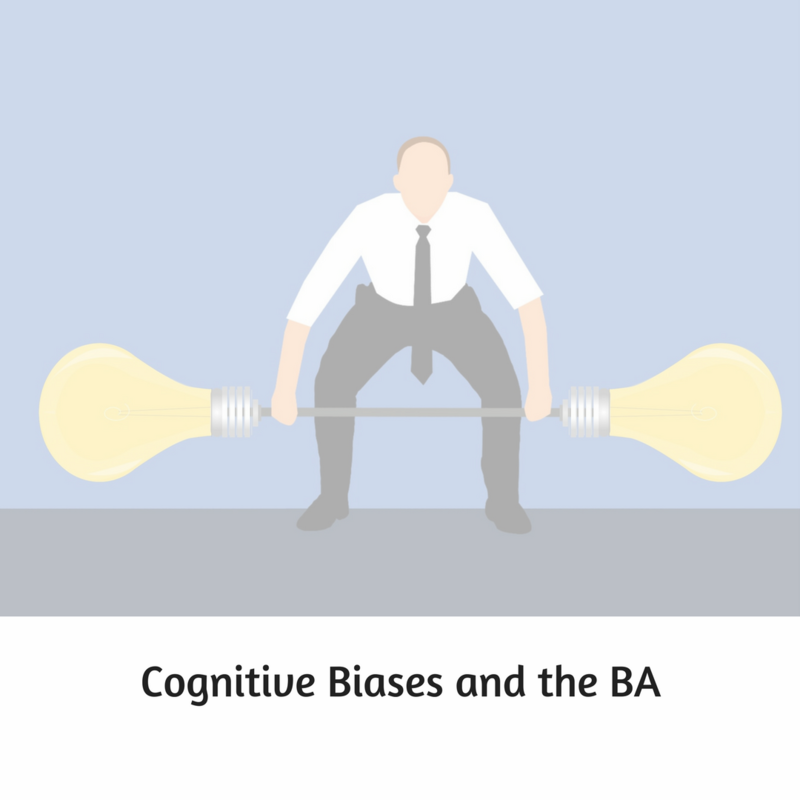 Early in 2018 I was a guest on Penny Pullan’s BA Virtual Summit, talking about cognitive biases and the Business Analyst. As part of this attendees were invited to submit questions to speakers. Penny was kind enough to transcribe our discussion and I am sharing it as a series of blog posts. Edited, of course, to make me sound like I can string a coherent sentence together! Penny: The question from Mark in the UK was, “Outside of business analysis, how extensively understood is the principal of cognitive bias? Me: Quite well, and it’s increasing in those areas where you have to deal with people, understand how people behave and how they make decisions. One of the areas of course, is economics. Economics theory has been based for years on the belief that people act rationally. However the evidence shows that people do not act rationally with money. Researchers have elaborated and identified a whole series of cognitive biases that people make around money and numbers, and how we behave instinctively. Economists can now use those to build different models and different understanding of how people might react in different environments. In the accounting and finance arena, I’ve seen huge documents on how to overcome optimism bias, which is the belief that the project will always go well. Obviously they’re very keen to make sure their forecasting is done well. The intelligence services have a great interest in cognitive biases. Because the nature of their role means they work without all the information they need. If, for example, their analysts start to stereotype people based on their assumptions rather than facts, then they’ll make the wrong decision. Another area that’s been taking advantage of them for centuries is sales. They may not have known they techniques they were using were taking advantage of cognitive biases, but boy have they been using them. At a market it was/ is a common practice to have one or more stooges in the crowd. Their job is to try and create a rush by making items look like they might become scarce. There was always a belief that people were stupid if they fell for that. A better understanding of cognitive biases shows that is not true. At a fundamental level, people do these things not because they’re not intelligent, but because it’s what we all do. You have to put in effort to think your way out of it: why has that person done that? Is that really scarce? What’s going on here? But by that time, the brain has made the decision for you, and you’re moving along with everyone else. Taking that into the modern world, there is the whole digital arena of website development. Good website design is all about making sites easy for people to navigate. Designers use patterns, so people don’t have to think, and the approach actively uses cognitive biases. When used well it means companies design websites that people can use easily, to find the information that they need as quickly as they can. And when it is a sales site, to persuade you to buy stuff. We’ve all seen the little timer that ticks down, saying that this price will only be here for the next three minutes… well, no it won’t! But it creates a sense of urgency and your brain goes: ‘Timer, timer, got to buy it now’. These are just a few examples. There are many areas where people want to understand how people react, how they make decisions and are trying to work on influencing them. This entry was posted in Cognitive Biases, Psychology and tagged bias, Pullan, Summit. Bookmark the permalink.